Israeli spying, Congress: Iran talks monitored, report says. 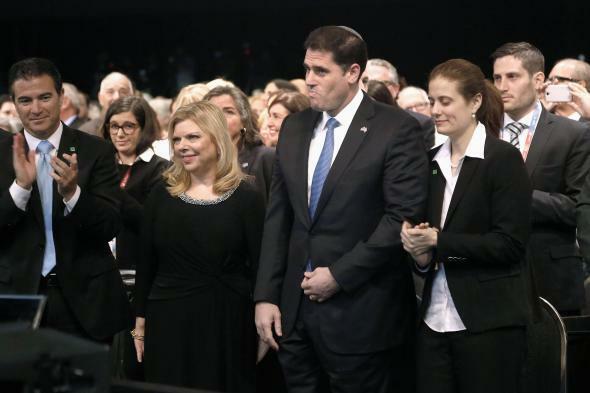 Ron Dermer (second from right), Israel’s ambassador to the U.S., and Sara Netanyahu (second from left), wife of Israeli Prime Minister Benjamin Netanyahu, attend the PM’s speech to the American Israel Public Affairs Committee in Washington, D.C., on March 2. The Obama administration’s negotiations with Iran—over a potential deal to reduce economic sanctions against that country in exchange for limitation of its nuclear program—have become a major issue in both Israeli and American politics. Israeli Prime Minister Benjamin Netanyahu was critical of the potential deal during his recent re-election campaign, while 47 Republican senators signed an open letter addressed to Iranian leaders warning that future American administrations might overturn executive-branch policies agreed to by the Obama White House. The Journal’s piece says that Ron Dermer, the Israeli ambassador to the United States, has been meeting with members of Congress in recent months to lobby against a U.S.-Iran agreement, and asserts that during these meetings Dermer has shared specific and classified information about potential deal terms that had not been previously disclosed to legislators by the Obama administration. Of note: The Journal says that Dermer’s lobbying efforts have generally been directed at Democrats because Israel already assumes the support of most Republicans.